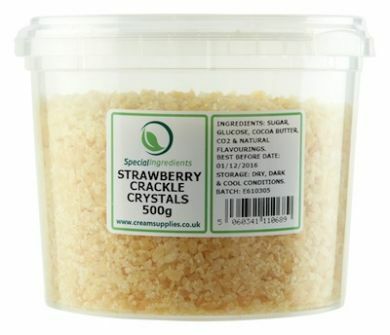 Strawberry flavour popping candy in a large 500g pot. 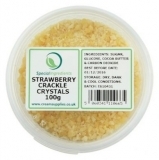 This is popping candy specifically designed for cooking with rather than the confectionery popping candy of the 1970s. It is encased in a layer of cocoa butter which protects it from moisture - so it keeps its pop until the cocoa butter melts in your mouth! Sugar, Glucose, Cocoa Butter, Carbon Dioxide, Flavourings.